Gwen Caviness, MPH – GSI Environmental Inc.
A long-delayed and highly anticipated supplement to California’s vapor intrusion (VI) guidance is scheduled to be released for public comment in early 2019. The guidance, titled “Interim Supplemental Guidance: Screening and Evaluating Vapor Intrusion” (Supplemental VI Guidance), will have significant implications for property owners, developers, responsible parties, and attorneys with VI sites throughout California. The Supplemental VI Guidance is being developed collaboratively by representatives from the Department of Toxic Substances Control (DTSC), the San Francisco Bay Regional Water Quality Control Board (SFRWQCB), and the State Water Resources Control Board. It is intended to supplement and, in places, supersede existing VI guidance published by each of these state agencies. The Supplemental VI Guidance revises California’s approach to evaluating and managing human health risks at sites with potential VI concerns. 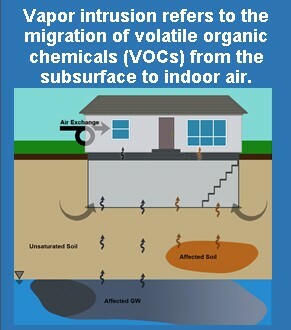 As presented by the agencies issuing the guidance, the primary objective of the Supplemental VI Guidance is to better protect current and future building occupants from exposure to volatile organic chemicals (VOCs) migrating from the environment to indoor air of buildings. The guidance incorporates technical information from recent research regarding VI and addresses previous inconsistencies in methodologies between various state agencies and the U.S. Environmental Protection Agency (U.S. EPA). Recommendations in the Supplemental VI Guidance are intended to encourage responsible parties to fully characterize VI sites, develop a more complete conceptual site model regarding VI issues, (including identification of VI sources, transport mechanisms, and exposure pathways), and more aggressively institute active remediation strategies rather than rely on long-term VI mitigation. The Supplemental VI Guidance also includes a general framework for making risk management decisions and selecting actions for addressing current and future VI risk. The Supplemental VI Guidance is not intended to be a comprehensive, stand-alone guidance on investigation, remediation, or mitigation of VI and does not specify cleanup goals, remedial strategies, or closure criteria; however, as discussed below, the guidance is likely to have substantial impacts on all of these issues. It is expected that, once the Supplemental VI Guidance is finalized, environmental regulatory agencies throughout California will apply the guidance in their assessment and management of properties with potential for VI. Some agencies have already implemented elements of the guidance and are likely to continue to do so during the public comment period. In this newsletter, we discuss the potentially significant implications of the Supplemental VI Guidance to the thousands, perhaps tens of thousands, of relevant sites across California. IMPLICATION 1 – MORE VI INVESTIGATION WILL BE REQUIRED: The Supplemental VI Guidance sets forth a more prescriptive investigation process and more conservative soil vapor and groundwater VI screening levels than required in the past. More prescriptive investigation: The Supplemental VI Guidance recommends a prescriptive process for investigating sites where VI is a potential concern, including (1) delineation of VOCs within 100 feet of each VI contaminant source, (2) development of a conceptual site model with respect to the origin, fate and transport of all VOCs, and (3) multiple rounds of indoor air sampling to assess VI risk in existing buildings. Due to the proximity of many properties and buildings to potential VOC sources (e.g., dry cleaners), these recommendations are expected to increase the number of sites requiring VI investigation, as well as the amount of sampling required at each site. Significantly, representatives from the SFRWQCB recently acknowledged that the Supplemental VI Guidance will lead to the re-opening of closed sites in the San Francisco Bay Region (Region 2), though the SFRWQCB has not identified which closed sites it intends to re-open or the criteria that it will apply to select or prioritize such sites. Re-opening of closed sites is anticipated in other regions of California as well. New soil vapor and groundwater VI screening levels: The Supplemental VI Guidance recommends soil vapor and groundwater VI screening levels that are significantly lower (more stringent) than previous California agency-recommended screening levels. This change means that many sites at which VI was not a concern will now require sampling and evaluation, and potentially remediation or mitigation, to address VI concerns. In contrast to previous state guidance, the Supplemental VI Guidance recommends soil vapor screening levels developed using only one attenuation factor (AF) – the U.S. EPA empirically-derived AF of 0.03 for sub-slab and subsurface soil vapor. The U.S. EPA AF of 0.001 is recommended for evaluating the VI pathway from groundwater. The term AF, defined as the ratio of indoor air concentration to subsurface concentration, is used as a measure of the decrease in concentration that occurs during vapor migration from the subsurface to indoor air. Prior guidance permitted use of a range of AFs based on building type (e.g., existing or future building) and sampling depth (e.g., sub-slab or subsurface) and allowed for development of site-specific AFs using site-specific soil types and vapor intrusion models. Under the Supplemental VI Guidance, the previous AFs and site-specific AFs derived from models, such as the Johnson and Ettinger model, are not recommended for the initial VI evaluation and screening of occupied buildings. On January 24, 2019, the SFRWQCB published updated Environmental Screening Levels (ESLs) for soil vapor, groundwater and other environmental media. The new soil vapor ESLs were developed using the AF of 0.03 recommended in the yet to be released Supplemental VI Guidance. The difference between the previous and new soil vapor ESLs are shown in Tables 1 and 2 below. The new groundwater VI ESLs have been developed using the U.S. EPA AF of 0.001 recommended in the Supplemental VI Guidance. For a number of chemicals, including tetrachloroethene (PCE) and trichloroethene (TCE), the new groundwater VI ESLs are more stringent (lower than) the maximum contaminant levels (MCLs) normally applied to drinking water. Use of the AF recommended in the Supplemental VI Guidance will ensure that consistent screening levels are applied across agencies and sites within the State: however, use of a single AF for each media does not support consideration of site-specific conditions, building construction or climatic conditions unique to California. In some cases, the new soil vapor AF will be 60 times more conservative than current AFs applied by state regulatory agencies. Use of the more conservative AFs is likely to significantly increase the number of sites at which VI investigation, remediation and mitigation are required. The new screening levels will increase the number of sites requiring VI investigation, the amount of sampling required at each site, and may lead to the re-opening of closed sites. 100 Foot Inclusion Zone: The Supplemental VI guidance requires soil vapor sampling within 100 feet of a VOC source area and source delineation in all directions, including off-site properties. All soil vapor samples must be collected from at least two depths at each location and sampling must be repeated at least twice (in different seasons) to assess spatial and temporal variability. More investigation, including indoor air sampling, is required if VOCs are detected in soil vapor above the new screening levels within 100 feet of a VOC source. Conceptual Site Model (CSM) Development: Recommendations set forth in the Supplemental VI Guidance are intended to encourage responsible parties to more throroughly identify VI sources, transport mechanisms, and exposure pathways at each site. The existence and role of preferential pathways (e.g. sewer lines) must also be evaluated. Although the potential importance of preferential pathways, including vapor transport via sewer lines, is highlighted in the Supplemental VI Guidance, the guidance does not provide specific recommendations on how to interpret the presence or absence of VOCs in such pathways. The role of preferential pathways, including sewer lines, must be evaluated under the Supplemental VI Guidance. Indoor Air Sampling: Increased emphasis on indoor air sampling is anticipated under the Supplemental VI Guidance. Agencies are expected to rely primarily on indoor air data to evaluate current exposure and health risk to occupants of existing buildings and to support risk management decisions at sites where the site buildings are expected to remain in place for the foreseeable future. This is a significant change from past practices which allowed for the modeling of indoor air concentrations from existing soil vapor data when evaluating existing buildings. Soil vapor data will be used to assess future VI risk associated with potential changes to existing buildings, including aging of buildings, and redevelopment or future construction of buildings. Additional recommendations of the guidance, including the need to collect sub-slab soil vapor samples concurrently with indoor air samples, and the recommendation to repeat indoor air sampling at least three times (over different seasons), will significantly impact the cost and time associated with VI investigations and, for development and construction projects, time to occupancy. Reliance on indoor air sampling to evaluate potential impacts to off-site properties will also increase the need for access agreements, disclosures and effective risk communication. It is also likely to increase the potential for legal claims related to off-site conditions. Active Remediation: The Supplemental VI Guidance explicitly states a preference for active remediation that removes or destroys VOCs, rather than reliance on mitigation measures. Thus, under the new guidance, more sites will require active remediation to address VOC contamination. Those sites may also require interim or permanent VI mitigation measures if residual VOC concentrations exceed the new more stringent screening levels. The agency preference for active remediation could substantially increase costs and the amount of time required to address VOC impacts at VI sites in California. Mitigation Measures: The Supplemental VI Guidance references the DTSC (2011) Vapor Intrusion Mitigation Advisory (VIMA) for agency recommendations for mitigation measures. However, in contrast to past practices, use of mitigation measures will be considered a short-term solution only and thus, will be limited to protecting building occupants until site investigation and active remediation have been completed. Mitigation measures alone will no longer be considered sufficiently protective over the long term at most sites. Where mitigation measures are permitted, long-term monitoring is likely to be required to demonstrate continued effectiveness of these measures. Multiple rounds of verification sampling and ongoing monitoring, including sampling of indoor air, will be required to confirm that remediation and mitigation measures are effective and protective of human health; though the new guidance is not clear regarding the number of rounds or the required interval between sampling events. Additional requirements will likely include development of operation and maintenance and contingency plans, permitting through regional air quality management districts, and disclosures and communications to building occupants. Mitigation measures alone will no longer be considered sufficiently protective over the long term at most sites. Verification Sampling: The agency may require verification sampling to confirm that remediation and/or mitigation measures have effectively protected human health prior to approving occupancy of a building; however, the duration and frequency of verification sampling is not specified. On-going monitoring: Monitoring of site VI conditions, including sub-slab soil vapor and indoor air sampling, may be required as long as active remediation (e.g., soil vapor extraction [SVE]) is being conducted at the site. Detailed requirements regarding the data needed to support termination of SVE and monitoring is not provided. Contingency planning: VI mitigation systems require periodic maintenance. Agency guidance requires the responsible party to establish a plan and a mechanism to monitor the efficacy of the system and make repairs where needed. The plans will also be required to include a strategy for addressing VI in the future should site conditions change. Financial Assurance: VI mitigation systems may be required during remediation activities and even following remediation where contaminant concentrations cannot be reduced below applicable screening levels. As a result, VI mitigation systems may be required to remain in place for years or even decades. Agency guidance, as well as portions of the California Health & Safety Code, require responsible parties to establish a mechanism to fund future maintenance and monitoring of necessary mitigation systems. Completion of these financial assurance documents may be required prior to installation of mitigation measures, especially at redevelopment projects. Land Use Covenants: In addition to financial assurances, oversight agencies have required, and are expected to continue to require, recorded land use covenants (LUCs), commonly known as deed restrictions, in connection with installed vapor mitigation systems. The LUCs generally prohibit specific uses or activities at the property without prior agency approval and required compliance with certain maintenance, monitoring and reporting requirements. Each of these items significantly impedes the transfer, financing and development of properties with VI concerns. The lack of certainty regarding the requirements for and timing of site closure not only frustrates financing, purchase and sale negotiations, it also prevents property owners and developers from preparing meaningful time and cost estimates for required remediation work and project construction. In addition, current regulations provide only limited options through which a party can post financial assurances, further complicating site closure and transfer of properties with VI concerns. Given California’s focus on infill and transit-oriented development, these are among the issues that California regulatory agencies are likely to hear, if not address, as they proceed through the public review of their Supplemental VI Guidance. The absence of guidance regarding the requirements for completing VI investigations and/or remediation (i.e., an exit strategy) creates significant uncertainties regarding the obligations, costs and schedules associated with addressing VI at Sites in California. Next Steps: Following the release of the Supplemental VI Guidance for public comment, the agencies will conduct public outreach efforts, including workshops, at various locations around the State. Representatives from the DTSC and SFRWQCB have agreed to present the Supplemental VI Guidance at an event hosted by the ACBA. Look for an ACBA announcement of a VI presentation in the coming months. U.S. EPA and California State agencies often use the term vapor forming chemicals (VFCs) instead of VOCs. VFCs include VOCs as well as other volatile chemicals, such as mercury. San Francisco Bay Regional Water Quality Control Board (SFRWQCB). 2016. Environmental Screening Levels (ESLs). February.